Bonita “Bo” Money is best known for her behind-the- scenes work in Hollywood. Despite having success as a producer early on in her career, with the likes of “Let Me Ride” by Dr. Dre and other big name projects, she surprisingly still faced many barriers. Bo found that being, not only a young up-and- coming producer but also a young ethnic female, left her fighting for equal pay, respect, and most importantly a network of like-minded women. It’s no surprise then that Bo joined the “Green Rush” on an entrepreneurial whim, but with the complex legalities of an emerging industry that’s still considered federally illegal, Bo did what any smart women would do, foster genuine connections. As Bo learned to navigate the tricky landscape of this illegally legal plant, one of her best friends developed a case of MRSA, a bacterium responsible for causing debilitating almost untreatable infections in humans. It was out of this pure need, to provide her dear friend with compassion and healing, that Bo was able to co-create That Glass Jar™ a powerful cannabis-infused healing topical cream proven to cure the MRSA bacteria as well as a number of other serious illnesses. She quickly found however that touting a cannabis-infused topical was no easy feat. Not while our federal government refuses to acknowledge the medicinal properties of cannabis, a Schedule I drug for which they’ve secured a medical patent. The whole experience has led Bo to her niche, creating connections to build communities and open doors for all aspiring cannapreneurs, whether they’re working directly or indirectly with the plant. 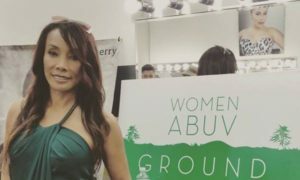 To our great fortune that resulted in her co-founding Women Abuv Ground, a networking organization dedicated to introducing women of color to the cannabis industry, which is by far the only platform to take on such a critical mission. Bo not only knows what it takes but is also eager to share the wealth of information. "The thing about it is, if you're not connected, like with any industry, it's very difficult." Tasting the canna-rainbow; talking gender and race with cannapreneur Bonita “Bo” Money.